Very rarely does the announcement of an assistant coach make news, but Livonia City FC (who play in the Michigan Premier Soccer League) has done just that today. 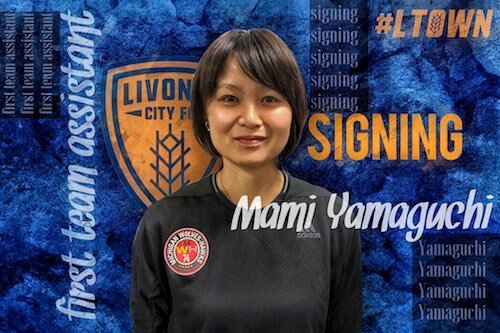 The club announced former Japanese International player, Mami Yamaguchi, would be joining the staff of the third year Livonia Women’s side. She will be the lead assistant coach under Trevor King. Few assistant coaches have the resume that Yamaguchi brings to the table. From 2005-2007, she played soccer for Florida State and won multiple honors, including the Mac Herman (the award given to the top player in the country). Florida State qualified for the final four every year she played with them and made the finals in 2007. Since her graduation, Florida State has honored her career by retiring her number and then inducting her into the FSU Sports Hall of Fame. Her track record of success only began with FSU. She went on to play with the Japanese National Team for four years, helping them qualify for the 2011 FIFA Women’s World Cup. She also played professionally in multiple leagues, winning several league titles. Upon retiring from playing, Mami has coached for several academies and schools. Her coaching career brought her to Michigan to coach with Michigan Wolves/Hawks, one of the top youth programs in the country and based in Livonia, MI. Craig Beebe, club president of Livonia City FC, sees the move as a big addition to the staff. “Her resume speaks for herself. The women in our club will be learning from someone who has truly done it on the highest level. Her talent and knowledge of the game is unbelievably valuable to our organization moving forward. She will surely help us on the field but possibly even in the boardroom as well, as we make tough decisions. The club will learn a lot from her.” Her addition to the club will certainly enhance a reputation for excellence that has been building over the last couple of years. In fact, Beebe credits Livonia’s men’s side’s success in the US Open Cup with making Livonia City FC an attractive option for someone of Yamaguchi’s status. What impact this former Japanese International will have on the Livonia women’s side remains to be seen, but the arrival of her ability, experience, and depth of knowledge should be seen as a massive asset to the women’s game for Livonia City FC. The club’s announcement of her joining their organization can be found here.